Berhampur (Odisha), February 21, 2018: Sea waves and winds have widened a portion of the beach near Rushikulya rookery on Odisha coast, boosting the prospects of increased mass nesting of the endangered olive ridley turtles this year. A sandbar near Podampeta village has been completely eroded and its sand has deposited on the coast. Because of it, a stretch of the beach has widened and its height has also increased. “This will surely protect several nests and eggs of olive ridleys near the sea from getting destroyed during high tides,” said Berhampur Divisional Forest Officer Ashis Behera. He termed it a “gift of mother nature” to the olive ridleys this year. Another sandbar at the meeting point of the river and the sea still exists. It would be the safest place for nesting of the marine turtles as there would be no chance of intervention from predators or humans. Mass nesting of olive ridleys is expected to start in a day or two as thousands of them have congregated in the sea near the rookery. Sporadic nesting of the turtles has already started at this major mass nesting site on the Indian coast. According to forest officials, the number of turtles coming out to the coast to lay eggs during the pre-mass nesting period has increased in the last three days. On February 17, nine olive ridleys had laid eggs on this coast. 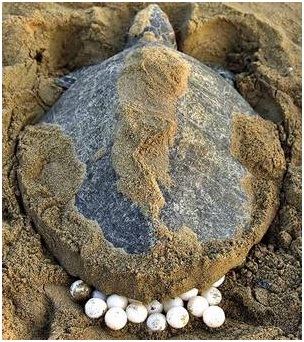 The number increased to 40 the next night and on February 19, 131 olive ridleys laid eggs on the beach. “We are expecting mass nesting to start in the next 48 hours,” said the DFO. Eggs from sporadic nesting sites are being brought to temporary hatcheries of the Forest Department for monitored hatchings. All arrangements are in place for the protection of olive ridleys and their eggs during the 45-day-long gestation period. The length of temporary fencing has been increased from 3.5 km to over 5 km to include areas where the turtles had nested last year. Patrolling in the sea is continuing to check entry of fishing trawlers to the olive ridley congregation zone where mechanized fishing is banned.